The days and nights are getting a little bit cooler, crickets are chirping outside our windows at the most unfortunate times to wake us from a deep slumber, Halloween decorations are showing up at the stores and, of course, delicious fall foods are cropping up all over the grocery store. When we asked our readers to share their favorite fall foods, we got great responses. On Twitter – follow us @staceyviera – pumpkin was singled out pretty quickly. @lorig prefers hers in pumpkin pie, whereas @zenmasterlauren will enjoy any dish with “pumpkin, cinnamon and nutmeg.” @jeffdonald reminded us that sports fans have their own fall favorites, and his is “chili paired with football.” (Jeff, doesn’t the leather get stuck in your teeth?) Reader Rebecca Nolen from Dallas, Texas, enjoys Brussels sprouts, and we hear that if you cook them just right, they really are quite tasty! Taking all of the great ideas into account, for this week’s post, we decided to go with a great idea from @rakhigupta and @volcanojw: butternut squash soup. Butternut squash, one of several types of winter squash, is an excellent source of Vitamin A (hence the color). It also provides Vitamin C, folate, potassium and fiber. 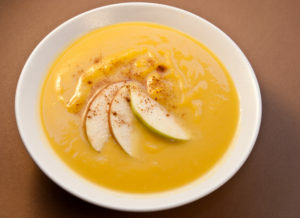 Since squash purees so nicely, it’s a great vegetable boost to other soups and sauces. Add apples to the pot with approximately 4 cups of stock and/or water. Make sure that the liquid covers the squash and add more if you desire a thinner soup. Cook covered for about 30 minutes, until the squash is easily mashed. Remove from heat. Puree the contents of the pot with an immersion blender to desired texture. Season to taste with salt and cinnamon, nutmeg or a few sprinkles of pumpkin pie spice. Adding apples to the squash soup adds fiber (mostly in the skin, so save that for a snack), Vitamin C, and additional fall food fun. What are your fall favorites? Add your comment or share it with us on Twitter @staceyviera. Happy Autumn and Happy Eating! How Stacey Got the Shot: ISO 800 at f/4.5 in ¼ second. Used a tripod and diffused lighting. Looks great! I’ve never actually made it from scratch; i’ve just had the canned stuff. I actually like to put chipotle sauce in mine. Sounds weird but I think the flavors work together. Looks amazing! I plan to make it today, so I will let you know how it turns out! YUM! It’s rainy on the eastern seaboard and this is the perfect food on a day like today. I love all the nutritional info along with a yummy recipe! I think butternut squash and apples totally scream fall! Ooh, that looks tasty! I’m not quite ready for fall lyet, but I’m ready for this soup! yum, i love this combo. is it really that time of year again already? Mmm, I like your addition of apples. Very healthy and very tasty! We doubled the apples and made the soup in the crockpot, whipping it up at the end with an immersion blender. Made the house smell amazing and was just what we all needed on a cold Minnesota afternoon.